Series: My First I Can Read! 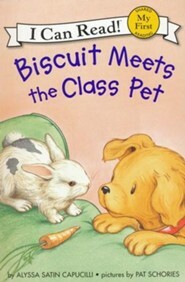 There's someone new at Biscuit's house—Nibbles, the class pet, has come for a visit. Nibbles likes exploring Biscuit's home and wants to play with all of Biscuit's toys. Biscuit isn't sure if he is ready to share with Nibbles, but soon Biscuit realizes that he likes having a visitor after all! 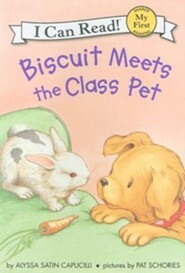 The youngest of readers will be delighted by the story of Biscuit's new friendship in this appealing, easy-to-read adventure. Alyssa Satin Capucilli is the author of the first story about Tulip and Rex, Tulip Loves Rex, as well as the bestselling Biscuit books and many other beloved children's books. She lives in a book-filled home in Hastings-on-Hudson, New York. Pat Schories's engaging illustrations of the puppy Biscuit are modeled on her own dog. In addition to having illustrated all the Biscuit books, she is also the artist and author of He's Your Dog and Mouse Around. Ms. Schories lives in Cold Spring, NY. 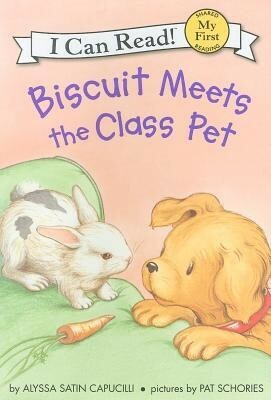 I'm the author/artist and I want to review Biscuit Meets the Class Pet.